I came upon this place by accident. I’d just finished dinner with Mr J at Meshiya, and was craving a little dessert. I thought we’d head over to Dessert House, because I was in the mood for some sago loving. Then as we walked along Russell Street, I almost walked into a sandwich-board sign. It doesn’t get more literal than that, right? We took a look at the menu at the door, I giggled a bit about the name of the place, and we headed upstairs. From the huge bouquets of flowers, you can tell the place had just opened. Walking in, I was impressed with the place – it’s partitioned off into little spaces, but only by frames, not screens, so it still feels quite bright and airy. 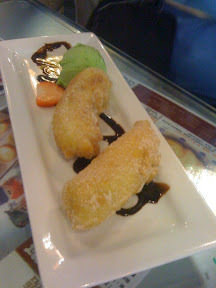 From what I can gather, Monga Sweet Cafe is a new branch of two other Mongas, in Box Hill and Glen Waverley. Geographically speaking, a pretty good pedigree for what is basically a Hong Kong style cafe. They serve some light cafe fare, like toasted sandwiches, but the main focus of the place is the array of Hong Kong style dessert. I had high hopes that I’d found a local version of Hui Lau Shan – one of my Hong Kong meccas. I ordered the mango sago with mango and pomelo. To be frank, it was disappointing. But then, Hui Lau Shan standards are pretty high, and it was the start of Autumn, so good fresh mango is hard to come by in Australia, unlike Hong Kong, where close proximity to tropical countries pretty much ensures a year-round supply of quality mangoes. And well, I think I’ve only seen pomelos once in Melbourne, so it’s not that surprising that was a little lacklustre too. But the main problem was actually that the whole thing was just too sweet. 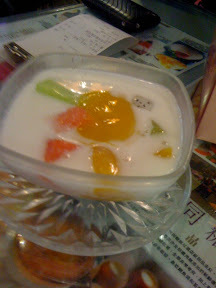 Mr J had the sago with coconut and mango. I think he was similarly underwhelmed. I’m curious to see how their toasted sandwiches are. I’m hoping in true Hong Kong style, the bread is thinly sliced and white, and the ham is bordering spam-like processed-ness. It’s a nice spot to hang out, so hopefully there are some redeeming items on the menu. 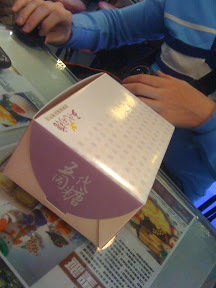 Five Generations’ egg pudding was the winner of CNN.go’s ‘Hong Kong’s best dessert‘ last year. This pretty much made it a must-try on our #fatty list. The first time we tried to go, it took us a while to find the place. It’s around the corner from where you might think it would be, though it’s not really hidden at all, there’s just no English signage. If you’re heading there late night (it’s open until 1 or 2 am most nights) just look for a crowd of young HKers milling around, waiting for a table. Partly because it’s tiny, and partly because it has a well-deserved reputation for being that good. Our second attempt, we went along with the @eatdrinkstagger kids, and discovered that Five Generations has a ticket system like Tim Ho Wan,so we grabbed a ticket, and wandered over to the food-on-a-stick stall across the road. I highly recommend the cuttlefish balls and duck giblets there. Mmmm, stick food…. 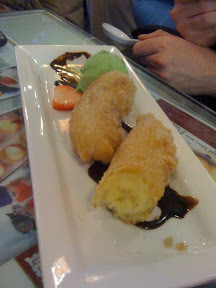 Anyway, it was a total boon having four of us there, because it meant we could order and sample more desserts! 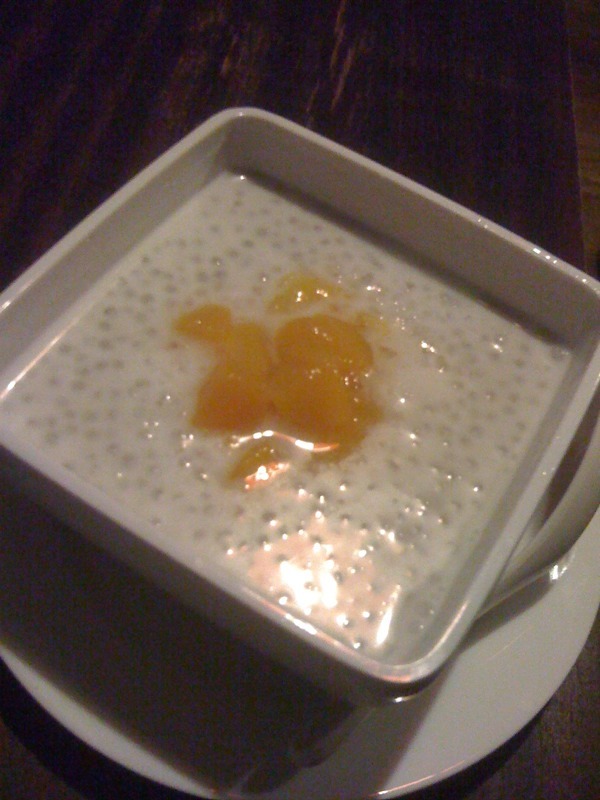 First up was the sago pudding with fresh fruit. Not all that much to look at, and more of a sweet chilled soup than a pudding, but I quite liked this. It’s a simple dessert, all about coconut milk and sugar. The next item to arrive at the table was a guava snow storm, or something to that effect. 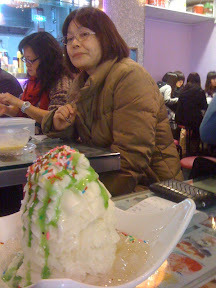 It was a mountain of a peculiarly textured shaved ice. They had a big special machine which did the shaving, and though I haven’t seen it here in Australia, there were places selling the same thing in Malaysia. The guava flavour was strong and refreshing, though I could have done without the hundreds and thousands on top. I guess they wanted to create that carnival shaved ice show cone feel? And no, that woman in the background isn’t that dubious about the dessert, she was looking dubiously at us all because we were taking about ten shots of each dessert that arrived at the table. Bloody food bloggers. I was a tad dubious about the next dessert. Though I shouldn’t have been, because you can’t really fault a banana fritter. Unless the banana is under-ripe. And this was not. Moreover, it was not only battered and fried, but then dusted with caster sugar and cinnamon! Banana fritter donut! All sorts of genius WIN. Served with a pretty non-descript chocolate syrup, and some decent green tea ice cream, I’d definitely have this one over again. But then we got to the main event. 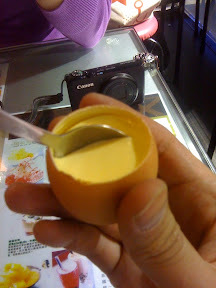 The egg pudding. Since there were four of us, we clearly weren’t going to be able to share one, or even two, between us. So we did what any self-respecting sugarphiles would do: we ordered the six pack. 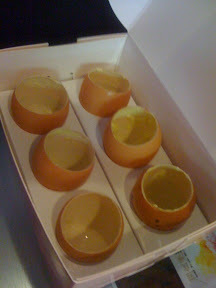 Yup, when you order the six pack, they come in actual egg shells, instead of the cute glass egg cup. I think the egg shells provide just as much whimsy, but each serving is just the little bit smaller than the individual serve. 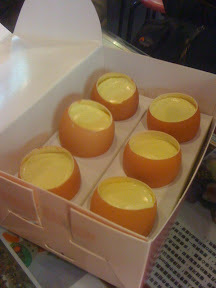 The egg pudding is smooth and creamy, yet rich and egg-y. I think Gem described it as an ‘egg pannacotta’, which is pretty apt. Trust me folks, it lives up to the hype, and even if there’s only two of you, consider getting the six pack. 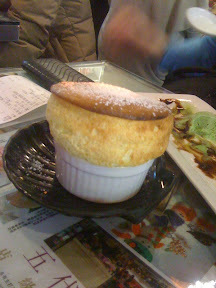 We rounded out our tasting banquet with a ginger souffle. It was pretty impressive when it arrived at the table. But with our incessant photographing, it was looking a little deflated by the time we actually dug into it. 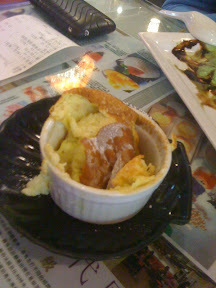 While I liked he ginger flavour, it confirmed for me that souffles, while a technical marvel, aren’t really my cup of tea. The texture was a tad rubbery, though it was still pretty light. I’d just prefer a cake or pudding, I think. So if you’re in Hong Kong, and eating at a restaurant in Tsim Sha Tsui, skip the dessert, and head on over to Five Generations. You won’t regret it. I had the good fortune of tagging along to the tail end of one of Mr N’s friends’ birthday celebrations the other night. The group was moving on for dessert, but I had yet to have dinner. Thankfully, the kind folk at Soto (short for South of Toorak, the new incarnation of Pizza e Vino) still kept the kitchen open late on a Tuesday night. It was also their official opening night, renovations having been finished over the weekend. Soto has a modern feel to it, with architectural ruses such as curtains to separate dining spaces, and a good mix of traditional and communal dining. Being a large group, we took over the large square table which dominates the front area of the restaurant. The service was responsive, welcoming and generally very convivial. For my late repast, I chose one of the pizzas from the menu. It was a decent thin crust, with prosciutto, confit potatoes, asparagus and ricotta(?) artfully placed, topped off with some fresh basil and what I think was baby cress. It was very tasty, though I’m not 100% sure the asparagus was necessary. The rest of the group meanwhile indulged in desserts and coffee. Here’s a look at Mr N’s chocolate fondant, which looked deliciously gooey, and there was a chorus of approval from around the table for the various desserts. I was impressed by this new version of Pizza e Vino, and hopefully I’ll be back soon to try some of the mains from the menu. I’m fairly sure I remember seeing belly pork on there! My friend invited me to a dinner party on the weekend, and I offered to bring dessert. The last dinner party we had co-hosted with another friend had consisted of no less than six courses, so the bar was high. Top left is crema catalana. A variation on creme brûlée, only accented with citrus and cinnamon instead of vanilla. Next to that, is a baked peach in filo, topped with pistachio and cardamom spiced ricotta. In the foreground is some orange, date and fig gastrique, and finally two macarons: one with a dark chocolate and tangello ganache, the other with white chocolate and passionfruit. All in all, a smashing success! Paired with a Yering Station late harvest Pinot Gris.